Listing accomplishments. Don’t even think about just rattling off amazing things you have done, people you have met or places you have visited, etc. Way too broad and BORING!! Bragging is not a good way to make friends! Death, divorce, tragedies in general. It’s not so much that these can be downers, but they’re such powerful topics that they can be very challenging to write about. (the “death” topic applies to family, friends and even those beloved pets.) HOWEVER, if you have lost someone dear to you and it has rocked your world–you probably should try to write about it. Just try to make the essay more about your feelings, how it affected you and what you learned than just about the person you lost. “The most important thing/person in my life.” Again, this is just too broad and loaded, whether you want to talk about God or your mom or your best friend. Yawn!! Sports. The thrill of victory. Agony of defeat. Done. Dull. Avoid if possible. Humor. Although a story you convey in one of your essays may be funny, do not try to be funny—there is a difference. Keep your deliver straight. “I’m so lucky.” Many college-bound students are privileged to live in beautiful, affluent towns and cities, and that’s great, lucky you!, but talking about this is plain boring. Do-good experiences. These can range from mission trips to Costa Rica to volunteering tutoring through the local schools. Although essays can certainly involve these experiences, the topic needs to be on a specific experience within that broader trip or program. There is a huge difference. Essays that basically describe trips or volunteering are boring. Specific, unexpected things that happen during them, however, can be great topics! Sensitive topics. Since you are writing for an audience who you want to want you, it’s important to use your common sense in terms of topics that have a high tendency to make people angry or upset because they do not agree with your opinion. Politics and religion are particularly provocative. No matter what, don’t preach about any topic! The un-essay. Many students, often some of the brightest, have a fundamental reaction to these essays and the assignment to reveal yourself in 500 words, so they want to get creative and in-your-face since that feels more genuine to them. They want to write in stream-of-consciousness or be sarcastic, etc. I totally understand this reaction. However, you must remember your goal with these essays: to get accepted! Save the radical expression for after you get into college. Illicit behavior. Drug use. Sexual activities. Arrests or jail time. Even if you stopped doing these illegal or unethical things, it’s still not the best idea to bring them up here. 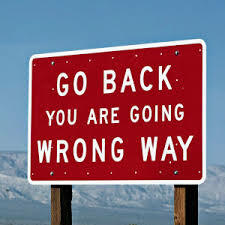 You can write about life missteps as long as it’s clear you have regained your footing! If nothing else, the admissions folks might just wonder about your judgment in general for not steering clear of these topics. Now that you know what not to write about, you can learn more about how to find great topics. In general, don’t try to impress your reader–it usually backfires. Instead, focus on something that happened, how it affected you and what you learned. Those stories are naturally interesting and impressive. If you want more help getting started writing, check out my Jumpstart Guide for writing college application essays. 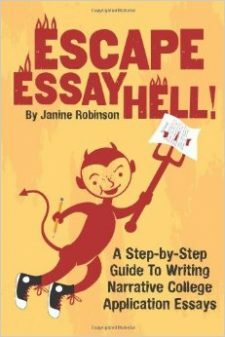 Also, my new ebook guide, Escape Essay Hell!, will walk you through 10 fast and easy steps for finding a unique topic and writing a narrative essay. Reading Don’t Go There: topics to avoid, was really helpful because it helped me understand the topics that are good to write about and the once that are bad. I didn’t know that most of these topics that are shown in Don’t go There: topics, people found boring. I always thought that most of these topics were good topics it turns out that there not so good. I’m glad I found out what topics should not be used, because know I understand witch are the major topics I need to avoid. This is a really helpful website were you could find the information you need to get help to write and essay. If I would of never read Don’t Go There: topics to avoid, I would of never known witch topics are right or wrong to write about. I now understand the difference about each topic and why it should and shouldn’t be used. Would wtiting about my shyness be a good topic for “the world i come from” prompt?